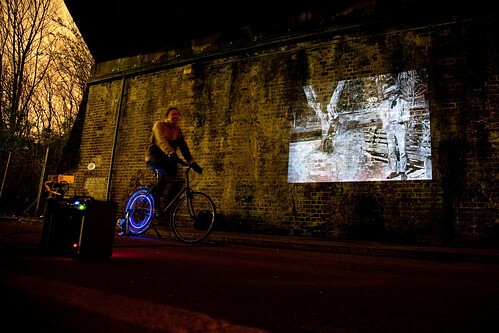 By the stealth of night we went along to a darkened tunnel beneath a railway bridge in Nunhead to test out the single bike pedal-powered cinema system. Howard and Neil from the Nunhead Free Festivals are picking locations for September's programme of events and wanted to test out a few possible venues in the local area. A spot in Bidwell Street, SE15 looks set to be made over into an impromptu cinema this September and we'll be powering a few of the shows. Nestled between flats, verges thick with bramble and crumbling brick we set up the bike generator and projected some Harold Lloyd footage onto the inside wall. There was something quite special hearing the piano tones echoing around the street along with the sound of the trains rattling overhead. We took some photos during the test which captured a little bit of the magic. Also note the blue light on the back wheel, we're testing these LEDs for a large scale installation for Earth Hour. Looks neat.